Plyometrics is a type of training that produces fast, powerful movements. These 12 jumping exercises – when done properly – give you stronger thigh muscles and firmer glutes. 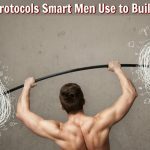 Plyometrics condition your entire musculature – including your cardiopulmonary system – and can change the shape of the body in a positive way. Another benefit of plyometrics is that – in addition to helping you feel fit and look strong – these movements can also dramatically help your sports performance. Jumping is among the most intense exercises there are. Any safe and regular workout regimen that includes plyometrics is almost certain to make you jump higher, run faster, throw farther, or hit harder. 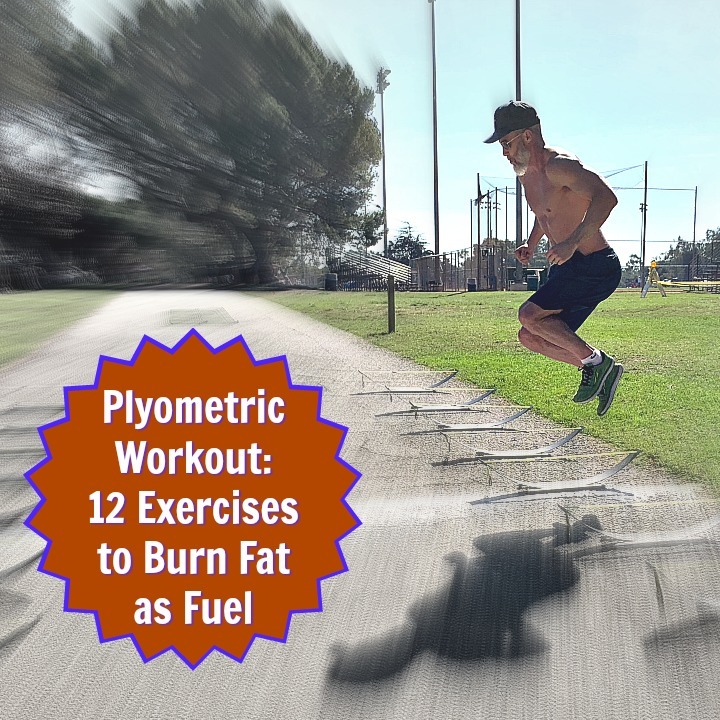 In the accompanying video, I’ve provided an example of a complete plyometric workout with 12 high-intensity intervals. Plyometric exercises are jumping movements that can make you more athletic while giving you firmer buttocks, stronger legs, and a better-shaped lower-body. Plus, they are outstanding at burning calories. Limber-up gradually. Plyometric exercises require a more extensive warm-up than other types of workouts. Make sure to do some gentle mobility drills and joint movements beforehand. It’s important to be well-rested and free of injury in any of the limbs to be exercised before you start seriously jumping around. During Leg Day at the gym, you can choose to see plyometric exercises as the most important, most eventful part of the workout – and everything you do before that is in preparation. Because plyometrics involve impact, that means compression of the lower vertebrae of your spine. Therefore, it’s wise to do some back stretches beforehand. your shoulders should glide back. This will most likely feel awkward but is correct spinal alignment to benefit your lower back. Once you see how you’re supposed to look you can mentally take a snapshot of how it feels to stand tall and can remind yourself to return to that position anytime. It’s a good idea to regularly practice mobility techniques. Here are four gentle stretches that you can do before you begin your jumping workout. 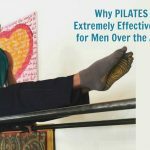 Sitting and driving, working at the computer, sleeping on your side, watching television – all of these sedentary activities are done habitually until they shorten the muscles in the back of the upper leg, which will – in turn – impact your lower back. To stretch your hamstrings, rest on the floor and wrap a towel or band around the bottom of your foot as you straighten your leg toward the ceiling. Breathe deeply and slowly, and never force the stretch. 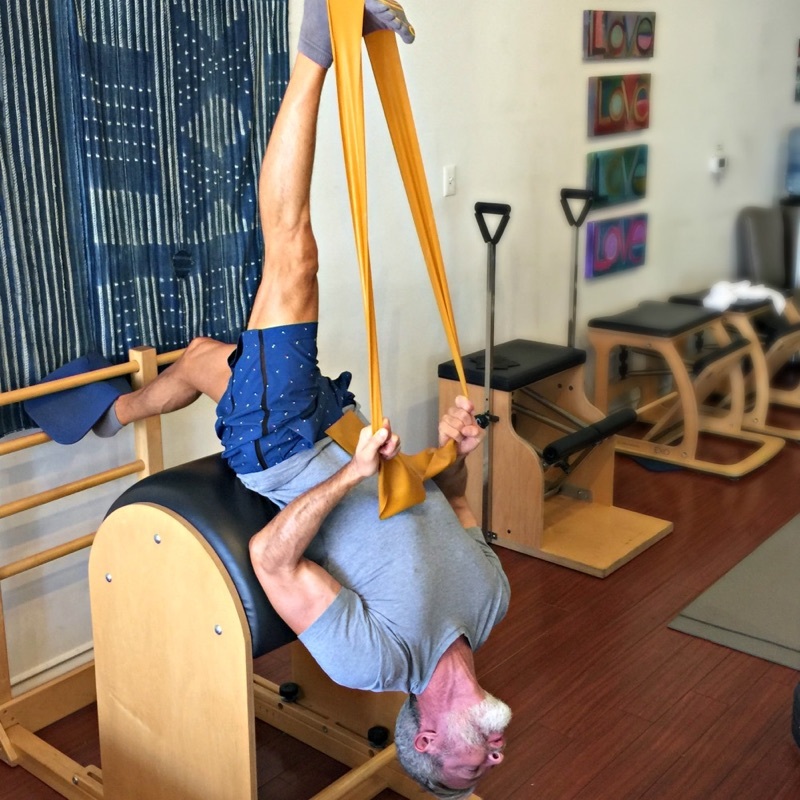 (In the photo above, I’m using a pilates barrel to give my stretch some extra depth). The sides of your waist, your outer thigh area, and the lowest part of your back – all of the muscles in these areas impact the proper alignment of your spine. They must maintain a certain level of flexibility! Relax on the floor, and slowly let your bent knees lower to rest on one side, while your neck rotates to gently gaze at your opposite, outstretched arm. After 60 seconds, repeat on the other side. When the hip flexors and psoas lack flexibility, this can then impact the proper positioning of the pelvis. If the pelvis isn’t centered, then the vertebrae of the spine have no foundation upon which to stack. If your hip flexors are really tight, just stretch one leg out along a bed or table, while the other foot presses into the floor (see photo below). If you’re more flexible, you can skip the bed, and just move into a lunge position with both hands on the floor. Advanced-level stretchers can do the “Couch Stretch” variation (see photo). The muscles in the buttocks get tight. Sitting on a foam roller (with one leg crossed over the other) while rolling on a foam roller is a great way to work deeper into the tissues of the gluteals. The highly focused, intense movements used in jumping do help the joints and tendons – but also can compromise them if you overdo it. So remember, though plyometrics are not inherently dangerous, you need to proceed carefully. I start off with 6 minutes of on the elliptical machine (or if I’m outside, a light jog) – to slowly raise my body temperature, and get the oxygen and blood flowing. Next, I proceed with the lower back stretches outlined above – then, a few of the easier leg exercises first, to gently lubricate the joints. To further protect your lumbar spine, make sure you are not doing any exercises with poor posture. Any bending and lifting from the ground require technique, especially if you’re lifting an oddly shaped object. Strengthening your lower back to prevent sudden injury is another effective line of defense which is accomplished by practicing core-strengthening exercises that stabilize your hips and lower back (please be aware that if you have a specific injury, the best thing to do is contact your doctor before trying any new stretches or exercises). A safe, smart regimen of stretches and strength exercises can help heal your lower back and keep it healthy, pain-free – and primed for your plyometrics workout. In the video above, you see I’m working outdoors at my local neighborhood park. However, you can also do these exercises at the gym. For Men: stronger legs, packed with power. For Women: firmer, shapelier thighs with definition. Below, I explain the exercises a bit further. If you’ve seen ice-skating races on television during the Olympics, then you already know what this exercise should look like. Do this exercise mindfully, especially if you have weak ankles. In the video, you’ll notice I jump over small hurdles to make it more interesting – and challenging. I also pause at the bottom of the squat for a little extra burn. Pay attention to your breathing (it’s tempting to hold your breath on this exercise, so try to keep your exhalations consistent). In the first variation, you can hold a kettlebell. In the second variation, use suspension straps and lean-back a bit. Beginners can do this exercise in place. Intermediate or advanced athletes can do this with forward movement. 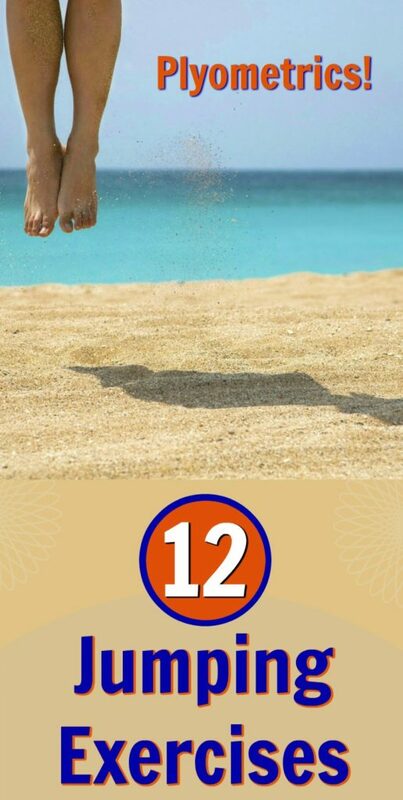 Simply jump your feet apart and bend your legs, then jump your feet back together. Be mindful of your knees. If it feels better for you to rotate your feel out a bit while you jump, that’s fine – as long as you turn your leg out from the hip and not just from the ankle. Remember, if any exercise causes you knee pain – make adjustments in your form, or just skip the exercise altogether. This time, you can jump onto something slightly higher. Beginner athletes, jump up onto a stable box but step back down (instead of jumping). Experienced athletes, jump up and jump down – but maintain your awareness. If your feet get tired, step down instead. First variation is to touch the box after jump down. Second variation is to add a burpee at the bottom. Please be absolutely certain your box is secured and won’t slide around. 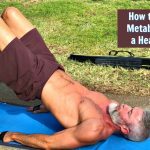 Keep your abdominal muscles engaged on this one. Beginners can do this exercise without the box. Keep your knees slightly soft – no locked joints! Ladies especially, please keep your pelvis centered while jumping rope. If you arch your back too much, you might pee a little while jumping. No joke. Use a hurdle to help challenge yourself to lift your knees higher than you would otherwise. Having strong legs should be a part of your longevity strategy, and the thing about plyometrics is: they work. Among my favorite plyometric exercises on Leg Day at the gym is the jump squat. In the first variation, use suspension straps and lean-back a bit. In the second variation, let your arms move as you jump. First you squat low, with your feet flat on the floor and your hips lowering a bit below knee-level (if you’re flexible enough for that) and your hands in a prayer position (if you have tender knees, then stop right at knee level – no lower). Next, jump as high as you can, as you raise your arms over your head. When you land, try to land softly, and return the hands to prayer position (but you can leave them out if you need them for balance). Tip: Be mindful of how you land on your feet. Many people tend to roll the soles of their feet slightly more to one side, so challenge yourself to land evenly on the soles of your feet with weight evenly distributed. Pay attention also to your knee positioning. You want some torque going outward (knees apart) before you jump. It’s kind of like screwing your feet into the ground so that some external rotation is created in the femurs – that way your hip capsule braces and is prepared for a healthy jump. Beginners can do this exercise in place. More experienced athletes can jump up onto something stable (in the video above, I jump onto park bleachers). See if you can do 6 to 12 repetitions (depending on your current level of conditioning), for 3 sets (with a two-minute rest between sets). Again, if it hurts your knees or back, stop. Seek assistance from a physical therapist, qualified fitness trainer, or your own medical doctor. One of the most common mistakes people make with exercise – besides not doing it – is to focus on one form of favorite exercise only. It’s easier to only take spin classes, or to only take yoga classes, or to only use a treadmill, or to only lift weights. What’s harder – but infinitely more effective – is to do a different form of exercise each day. The way to dramatically improve your health is to start thinking of yourself as a cross-trainer. To cross train means that each week you’re targeting your flexibility and your cardiopulmonary and your resistance training. Of course, if your lifestyle is currently sedentary (and most people’s typical week is way more sedentary than they realize), then the thought of becoming a cross-trainer can seem pretty overwhelming. The first workout you want to build into your weekly schedule is your Walk. Walking has a way of reorganizing the systems of your body and preparing them for increased fitness. Second, schedule yourself for once-a-week flexibility training. For example, I do all kinds of training each week: high-intensity interval training, bodybuilding, outdoor runs, etc. But among the most important of those workouts is my simple, once-a-week yoga class. It’s only 50 minutes long and it’s beginning-level, but it makes the rest of my week’s advanced workouts possible. Your weekly mobility training can look a variety of ways – a foam roller class, a Pilates session, yoga, or a stretching DVD that you do at home. Why? Because you can have the heart of a teenager and the muscles of an Adonis, but if your spine isn’t long, flexible and aligned – none of that other stuff will mean much of anything. If you’ve ever had a friend who suffers from chronic back pain, they will tell you first-hand: keep your spine healthy first! If you want toned legs and firm, round, lifted glutes – and if you want to achieve stellar heart and lung conditioning – you can learn how to do plyometrics correctly. Few exercises are more effective at shaping thigh muscles and firming the glutes than plyometrics. Jumping exercises make a great “burn-out” finisher on Leg Day, or you can do one designated plyometrics workout – such as the one provided here – once each week.